A woman has been killed on Westminster Bridge in central London in what police are treating as a terrorist incident. Another person died at the hospital. 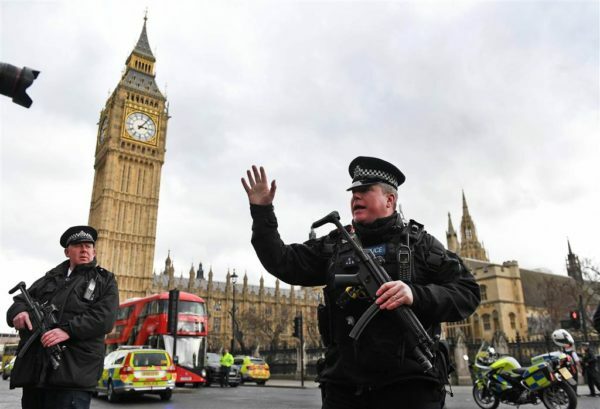 A police officer was also stabbed in the nearby Houses of Parliament by an attacker, who was shot by police. The attacker struck several pedestrians as he drove a car across the bridge, before crashing it into railings. A number of other people were hurt – some with “catastrophic” injuries – a doctor at St Thomas’ Hospital said. A Downing Street source said PM Theresa May was safe. Theresa May was seen being ushered into a silver Jaguar car as what sounded like gunfire rang out at Parliament during the incident.